In my wild back yard grew an amazing assortment of things that 'volunteered' as my dear mother would have said. I made a passing wish that I had a fig. Voila...there is a fig growing...and I didn't even plant it. My Cherry tree is laden, my grape vines are meandering everywhere. This is our attempt to taming the unruly place. It has been a haven for nature though. All manner of birds and assorted small animals have visited. I will tame part of the yard and let the rest be for now. I want to harvest the grapes and the cherries before hacking away at anything on that end. I will post the planted garden (almost done there!) and we shall watch it grow. 30 Apr 2007 @ 01:16 by hgoodgame : I love them volunteers! Grapes, There's several ways to do them depending on how you want them to grow. I've got one that covers a deck arbor, so you can kinda shape them how you want and then keep nipping them back every year.. ya gotta head em back hard while they're still just branches, preferably not too long after they lose their leaves in the fall. Then you can use the vines for wreaths and whatever you can think to weave, maybe an arbor for the grape to climb on! They produce only on the new wood, that's why cutting them back is so important. Have fun with your garden Skooks! yes I KNOW yer supposed to cut back the grape vines...I have to rely on my kids to help me on that one. I ignored them.. for years I tried to get them to grow...and then when I was able to work on my personal chi and all...well...pow.. they exponentionally took the back yard by storm. I was working and taking care of all the kids and cooking etc. .. and well.. I neglected the back. Wasband had done a good job of ruining it before I booted him out of my side of the duplex. NOW...her majesty..(me) has returned to bring order to her kingdom. 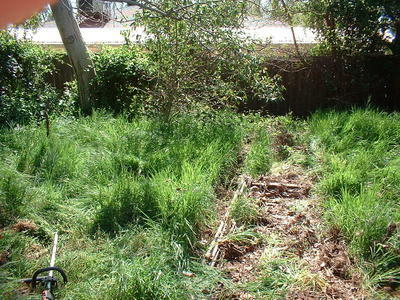 oh.. by the way... it is going to be an organic garden NO PESTICIDES...cept natural stuff. there would be an unbelievable shrieking into the heart of the night." no kidding.. but nothing new to farmers... who have had to struggle against mother nature so many centuries..
hope your garden does well.. give it that good chi..